The FOCAL Award was instituted by Janet McOuat, a founding member of the Friends of Children and Literature. The award, which is presented annually to children's books with California content, was first given to Leo Politi whose charming illustration of reading children has become the FOCAL logo. Annotated FOCAL Award List on LAPL's KidsPath. Each year a group of teachers, librarians, writers and others interested in children's literature meets to determine the new FOCAL winner. The winning author is presented with the award -- a unique puppet representing a character from their award-winning book which has been created for them by Carol Onofrio and is now being created by Jesse Kingsley. Also present at the awards luncheon are children who have won the FOCAL essay contest, their teacher, and a parent. View the LAPL catalog page. 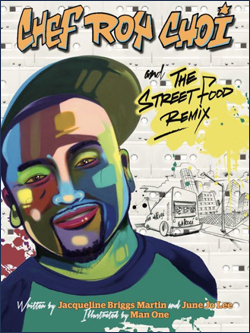 Chef Roy Choi calls himself a "street cook." The FOCAL Award Luncheon will be December 14, 2019.